No one likes high interest rates any more than they like managing multiple student loan payments every month. That’s why refinancing can help. It means you can consolidate to one monthly payment, instead of several, and refinancing can potentially lower your interest rate or help make your monthly payments more manageable. We’ve created a straightforward comparison chart, so you can see exactly why SoFi is a smart choice when refinancing student loans. We’ll compare loan structures, discounts, and how easy it is to actually refinance. We’ll also look at perks like unemployment protection, so you know what to expect if you find yourself facing an employment gap. 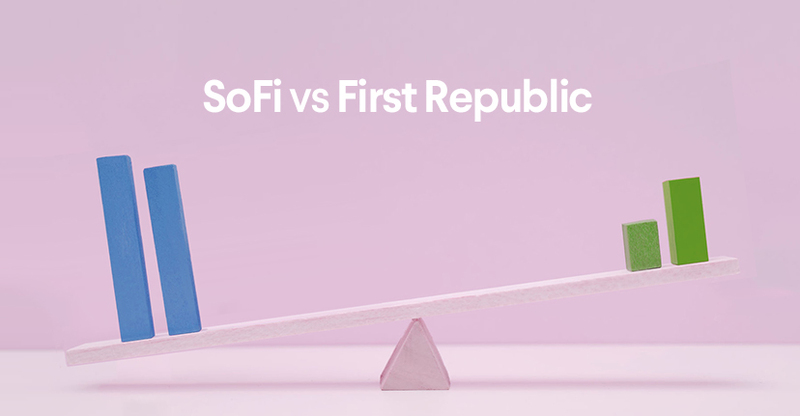 The goal of this information is to allow you to compare and contrast SoFi and First Republic Bank, based on information available on both websites, so you can choose the loan that works best for you and your unique situation. If you’re ready to refinance your student loans with SoFi, you can find your rate in just two minutes. When shopping around for refinancing deals, it might not even occur to you to ask if the refi converts student loans into “consumer loans” (kinda like personal loans). But this leads to a crucial point: at First Republic Bank, they convert the student loans they refinance into consumer loans, which means that you can no longer write off any part of these loans on your income taxes. At SoFi, when we refinance your student loans, they’re still considered private education loans. This preserves your tax write-off (up to $2,500 annually if you meet the tight eligibility requirements ). Plus, with SoFi if you need to change your loan terms in the future, you can apply to refinance again, unlike at First Republic Bank. Like most lenders, SoFi offers an AutoPay discount—and if you disable the 0.25% AutoPay benefit, your rate will go back up. At First Republic Bank? Your rate could increase up to a full 2% if AutoPay and direct deposit requirements aren’t met. We’ve designed our application process for on-the-go professionals who don’t have time for a two-hour, in-person sit down. You simply apply to refinance online at any time of day. At First Republic Bank, you have to visit a branch and meet with a banker to fill out an application in person—without even knowing if you’re pre-qualified. Which sounds easier to you? Let’s take another look at this side-by-side comparison. As with most student loan refinance companies, including First Republic Bank and SoFi, refinancing means you forfeit certain benefits offered with your federal loans (such as income-based repayment plans and access to the Public Service Loan Forgiven). But at SoFi, if you lose your job through no fault of your own, you can apply to have your payments suspended. We call it our Unemployment Protection Program, and it is offered for those eligible in three-month increments for up to a year in total. You can either make interest-only payments during this time or stop payments entirely, in which case the unpaid interest accrued during that time will be added to your principal balance. Our career team will even work with you to help in your job search. First Republic Bank’s program is quicker to explain. They don’t have one. Yes, most federal student loan programs and even some private loan lenders offer a deferment or forbearance option of some sort, but they don’t really address the actual issue: That the borrower has lost his or her main source of income. And that’s the SoFi difference. We combine loan forbearance with powerful job search support. Having a successful career is so much more than being able to work to repay your student loans, and we help you get your career back on track. This doesn’t mean that we’ll want you to take the first job you’re offered. Instead, we help you to develop your personal brand, rewrite your resume, determine your ideal job, and more. But of course, before you refinance, we recommend that you consult a qualified financial advisor to figure out whether it’s the right choice for you. We’re all about large-scale, meaningful change. Specifically, meaningful change for you and your finances. At SoFi, we offer a community-based membership that focuses on networking, sharing experiences, and personal and professional growth. First Republic Bank? Not so much. If you’re ready to think seriously about refinancing, here’s how simple the process is with SoFi: You first get pre-qualified online in just two minutes. You then select your preferred rate and term, focusing on lowering your payments or shortening your term. Once you refinance with SoFi, you’ve got a new interest rate, a new loan term, and one monthly payment instead of multiple. It’s really that convenient. Ready to make a dent in your student loan debt? In just two minutes, you can find out what your rate would be if you refinanced your student loans with SoFi. The analysis and information above, while believed to be accurate, is not guaranteed by SoFi. The information was gathered from publicly-available websites and is current as of October 31, 2018. Any product name, logo, or other trademark featured or referred to above is the property of its respective owner.